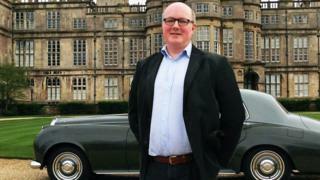 The owners of Tudor stately home have been fined £266,000 after a butler was crushed to death by a faulty lift. Arthur Mellar, 47, died after being seriously injured at Burghley House, on the Lincolnshire-Cambridgeshire border, on 12 July 2014. Peterborough Crown Court heard the lift fell onto Mr Mellar as he tried to free a jammed item of luggage. Burghley House Preservation Trust previously admitted it failed to ensure the welfare of an employee. Mr Mellar got caught between the lift cage and the banister of the lift housing as he attempted to dislodge the baggage, the court heard. The Health and Safety Executive, which brought the prosecution against the trust, said it was a "completely avoidable incident". There were no safety measures in place to prevent it and the lift had not been inspected by an engineer since it was installed in the late 1950s, the court heard. The court was also told the trust did not conduct a safety risk assessment on the lift, which was used to transport guests' luggage from different levels of the house. Mr Mellar, from Barnsley, South Yorkshire, had worked at the 16th Century Burghley House for nine years. Judge Sean Enright fined the trust £266,000, along with costs of nearly £17,000. David Pennell, estates director at Burghley House, said: "Health and safety matters have always been paramount across all activities at Burghley and what happened to Arthur Mellar in July 2014 was a dreadful and tragic accident." "Our thoughts are with Gerwin and Arthur's family at this time," he added. The mansion has been used for locations in the films Pride and Prejudice and The Da Vinci Code.